Perfect for your bakery, market, or deli, these Durable Packaging 6" x 10 3/4" Green Choice interfold Kraft unbleached brown soy wax deli sheets combine functionality and efficiency with eco-friendliness! Made from natural Kraft paper with a soy blend eco wax, these chlorine-free tissue sheets are durable, absorbent, and have ultimate grease-resistance. I got creative with the use of these unbleached brown soy wax bakery tissues. I wrapped cookies in it, I decorated (and protected) gift boxes with baked goods in them, I used it as decorative element on a jar of candied ginger. And I will use them at farmers markets to sell my baked goods. Great product, and it is important it is not bleached. We purchased these for our dessert table at our wedding for people to make to-go bags. This tissue with little bags made it easy for people to grab desserts on their way out to save for a midnight snack. Although I expected these tissues to be white, they are actually light brown. They are good quality & do not rip when pulled from the box. I bought them to use during a party, but as an unusual addition, most guests simply used their fingers. As soon as I get it, I decided to bake using these wonderful papers. As a result I didn't have to tear off the burnt remains of the pie. Really useful! These are great! I love the quality and the fact that they are soy wax based. They work just like a bakery tissue needs to be used. Great price. We will continue to order these! I purchased these unbleached brown soy wax bakery tissue to wrap up and box my cookies. They work great and look nice. They keep any oil from going through the box. These are great for handle food items. Even though they are wax, they are absorbent so don't package or store items with these because they will absorb the moisture from your baked goods. However, these are very handy, good quality, and always seems like the perfect size. These tissues are great for samples, for volunteers touching bread, and for wrapping around small gifts. You can also flower fold it over a cupcake! We absolutely love this product! This tissue holds up very well as a base for our display trays and in our to go boxes. It also matches the kraft boxes very well to complete the eco look! I love these for both picking up/serving baked goods as well as for lining boxes and serviceware. I prefer these to the white ones and they are great quality. These ar perfect for a bakery case where guests grab their own. It keeps your baked goods sanitary. The box is also like a dispenser. You grab one and the next pops out ready to take! I really like this bakery tissue. The brown adds a nice, natural touch. I use these a lot for fried foods and have not had a problem with it tearing or getting too soggy. This paper tissue is a good option for serving light pastries etc. Each sheet pulls from the box well without taking a bunch out at once. Also the waxed paper has a good clean look to it! I love these baking sheets! I thought they would be a bit thin, but they work perfectly for our baked goods. They also give a very natural, rustic look to our products. Great buy. This product does everything that it is supposed to do. Since it's unbleached, it provides some peace of mind when using for food applications. The color is great if you want your food to look natural. This is an excellent wax paper. It's environmentally friendly, which shows itself on the box in nice graphics to show customers. It's also very cheap! We use these kraft paper bakery tissues for our bakery case near the register to avoid cross contamination and to keep things sanitary. Great value. These brown soy wax bakery tissues are strong and durable. I use them to pick up and seperate waffles, and to serve up samples at the markets. Love the color of this tissue. Use these on a daily basis for all my pastries. Also on the bottom of my cake stands and cookie plates. Perfect for keeping things sanitary when serving our baked treats - all products are picked up with these kraft tissues instead of constantly going through gloves etc. Super convenient and we love that they're unbleached. Excellent and economical bakery tissue! Easy to dispense, right out of the box. Perfect for bakeries to use for serving pastries and wrapping goods to-go. 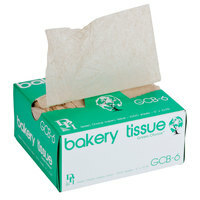 These are a great bakery tissue for the price. They are a little thin so if you need something more durable I would go up a tier. We used them for homemade ice cream sandwiches and they worked great but some tore when pulling them out of the box. I purchased these as a quick wrap for soap prior to using a cloth bag or more decorative paper. Soap oils can damage fine paper and these help prevent that. Will buy again. These tissues are nice for grabbing treats and donuts. they lay nicely in the bottom of the boxes. We often use these as a barrier instead of gloves of we are busy. We use these to line our boxes and trays in the display. If you putting dry product on top of this tissue then its great but for our chocolate cover strawberries the juices does go through. Perfect little liner to wrap our muffins! We try to make it rustic so adding a touchbof the jnbleach paper makes a great addition! Will definitely order more! These are such a great eco friendly choice for packaging my bar soap in. I can punch holes in it to allow customers to better smell and see the product, but they are transparent enough to see through the wrapping itself. And added with an eco friendly label, i love this option. Paper is more like a paper texture, than wax, which is just what i needed so the labels attach and stay! I ordered this brown tissue by mistake. However I like to use it when picking up product from my bakery case. It is still a great product but I just prefer the white ones you offer. Great tissues for getting pastries out of the case in a safe way. Less bulky waste in the landfill makes us happy as well. Thank you! we use the bakery sheets for just about every order. i prefer these over the white ones. to me these look more earth friendly and deco. I use these to grab cookies out of my display case and they work really well. I love that they are unbleached and made with soy! The box is super convenient and easily dispenses. I only bought one box to try them out and I know that I will be ordering a lot more. EVERYDAY product! We go through so many of these I should invest in the company! They are the best! A hidden plus- great little paper for wrapping baked goods! These are exactly what they appear to be. Nice quality paper (like at the grocery store's bakery) and they pull out of the box perfectly every time. I like the brown look and they look more professional when I serve cookies or croissants at the market. Excellent value. Very happy to find kraft bakery paper, little touches like that help set the bakery component apart in our coffee shop. Nice size, and good price! This tissue is incredibly useful in store and during markets to ensure sanitary handling of items as well as providing the customer with something to hold their baked good with. Good buy! We needed something to use to pickup rolls and cookies so we didn't have to use gloves all the time. These are the right size. We use these little wax sheets for everything. They work great for keeping messy spoons off your counter top. They are nice for wrapping things to go.